I wanted soup this week. This is unusual for me since normally I am not a huge fan of soup. 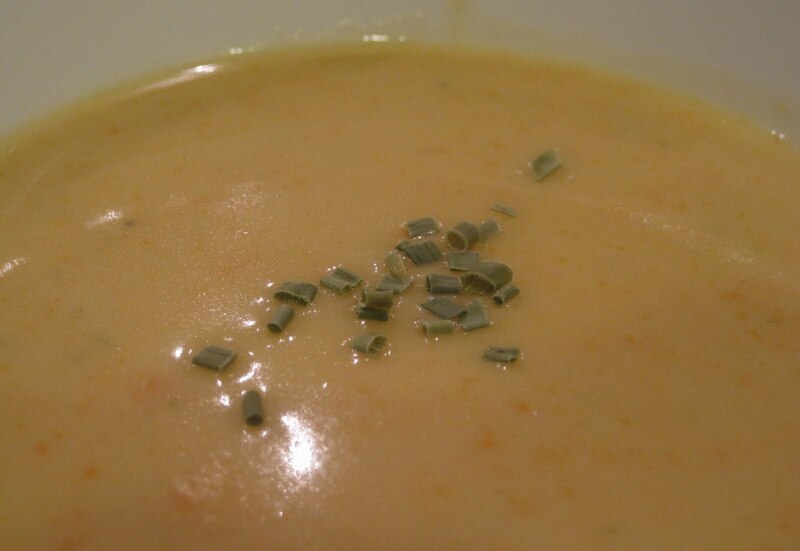 As I thought about soup, I remembered that once upon a time, I made an asparagus & potato soup. So I started googling asparagus & potato soup recipes. 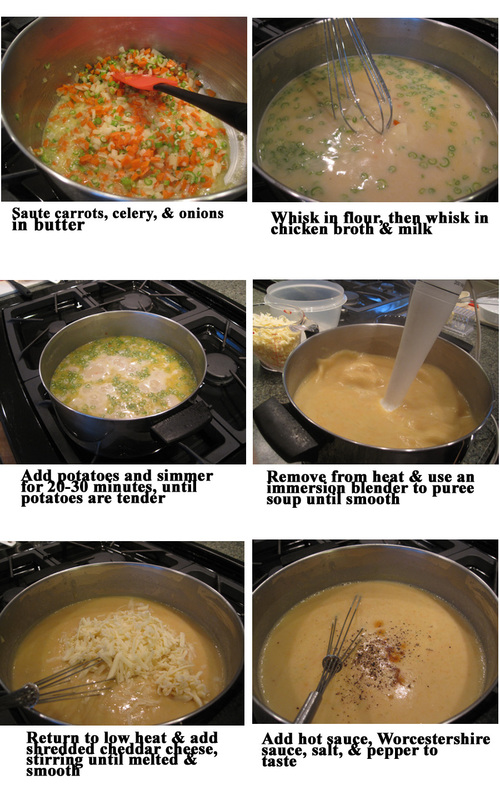 Then I got side tracked into lots of potato soup recipes. Potato & Ham. Potato & Cheese. Potato & Shrimp. And finally, the one that really grabbed my attention: Fully Loaded Cheesy Potato Soup. I think it was the cheese, beer, and Worcestershire that drew me to it. 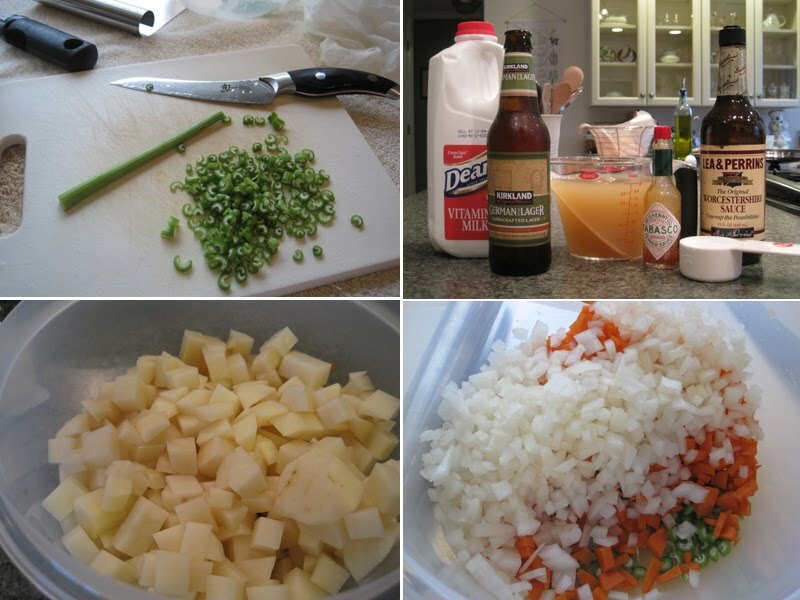 Saturday afternoon I gathered the ingredients and chopped the vegetables. I used the celery from last week's CSA and it was the slimmest celery I've ever seen!! It was cute, if celery can be called cute. Once the veggies were chopped, it was time to start making the soup. Like my Photoshop attempts?!! I've been experimenting in Photoshop, trying to add captions, trying to make a collage of photos. I have no how to manual, I've never taken a class, and I never bother clicking on help. I just keep mucking around until I get something sort of close to what I wanted. Note to self: next time, don't bold the text under the photos. I was too lazy and frankly, a little Photoshopped out, to try to unbold the text. You'll just have to deal with the fuzzy, bold text and other odd photoshopping creations as I continue to self-teach myself! The final step in making this soup: enjoy. The soup can be topped with bacon and/or sour cream and/or chives. Our sour cream looked funny so we tossed it. We didn't feel like cooking bacon just to garnish the soup. But I did sprinkle on some chives. This soup is delicious!!! I can taste the beer, and beer & cheddar cheese is a terrific combination. The hot sauce adds a bit of heat and the Worcestershire adds that extra zing to it. I like that it's pureed - so nice and smooth and creamy. Yum! I realize it's not super healthy with the milk & cheese, but it sure is tasty and comforting! In a large saucepan over medium heat, melt the butter. Add the onion, carrot, celery, and garlic and saute in butter until the vegetables begin to soften, about 4 minutes. Sprinkle the flour into the pan and continue to stir for 2 minutes to toast the flour. Add salt and pepper, to taste. Gradually whisk in the stock, then the milk and the beer. Stir in the potatoes and bring the soup to a boil. 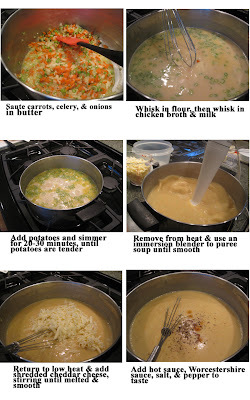 Reduce the heat and simmer the soup until the potato is tender, about 20 to 30 minutes. Remove the pan from the heat and using an immersion blender, puree the soup until smooth. Return the soup to low heat. Add the cheese a handful at a time, stirring until melted and smooth after each addition. Season the soup, to taste, with hot sauce, Worcestershire, and salt and pepper. 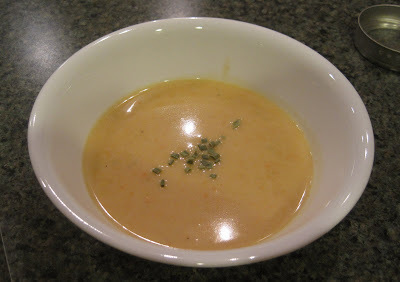 Divide the soup among bowls and top with sour cream, crisp bacon and chopped chives. This looks delicious. No real way around the dairy in this one, but luckily my vegan partner doesn't like creamy soups. On a side note: How often do you use your immersion blender? Is it worth getting one? I hate the soup to food processor transfer (too much risk of getting burned coupled with my hatred of extra stuff to clean) but it doesn't seem like I would use an immersion blender on anything outside of soups. Yeah, that pretty much IS all we use the immersion blender for - soups and sauces. It it's darn handy for those though. Greg had one when we moved in together. I'm not sure why he bought one, but we kept it. I think we've used it only once or twice in 2 years and only for soups. I agree on the food processor - too much risk of spilling, burning, and lots more to clean!